Pearl Jam pushes buttons, sometimes political ones, and has done so on and off for years. 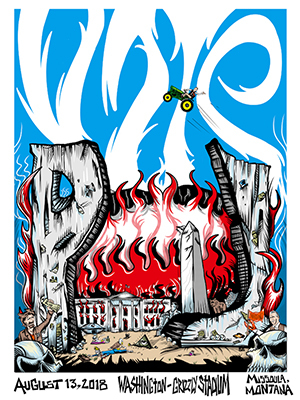 Most recently, bassist Jeff Ament co-designed a poster for the band’s August 13 show in Montana that depicts a burning White House and death and destruction raining down on Washington D.C. and President Trump. Back in 1994, Pearl Jam and its management took on Ticketmaster over the company’s business practices, and Ament and bandmate Stone Gossard testified before Congress on the issue, as Fred Moody detailed in Seattle Weekly. – Eddie Vedder upset some with on-stage “no more war” rant. Image: from Pearl Jam’s Facebook post. This entry was posted in Politics + Music and tagged pearl jam by Editor. Bookmark the permalink.